Glamorgan acting captain Graham Wagg was disappointed he was unable to agree a contrived run-chase with Northants in their rain-hit draw at Northampton. He discussed a possible victory target with opposite number Alex Wakely but failed to reach agreement in the County Championship Division Two match. "We spoke about a game, that didn't want to happen," Wagg said. "We went to them and offered them a game but they weren't interested so we had to do what we could do." Glamorgan lost three wickets before clearing their first innings deficit of 45, but batted out time on 99-3 thanks to Aneurin Donald (40*) and Chris Cooke (22*). 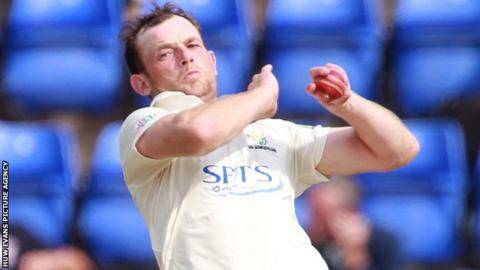 A calf injury to Mark Wallace, which left the wicket-keeper on crutches, saw Wagg - who had previously been a stand-in skipper at Derbyshire - take temporary charge of the Welsh county on the field. He was pleased with the performances of 18-year-old Donald and 21-year-old Dewi Penrhyn Jones on the final day. "Aneurin played really well there and there was a bit of pressure, which was good in a way because it wasn't an out-and-out dead game, there were a lot of overs left," Wagg said. "Dewi Jones has come in and bowled really well for his first game. At the end of the season there's not much to play for but there's a lot of individual stats [to play for]. "And every time we put on the shirt we play with big pride, and I think we did that quite well." Glamorgan will be without Wallace for the final game against Gloucestershire at Bristol on 22 September, but regular captain Jacques Rudolph returns after two games away on paternity leave in South Africa.